Hugh Farmer: My earlier article about early plans for trams on HK island (see first article below) stated that the official opening date was 30th July 1904. This is correct. 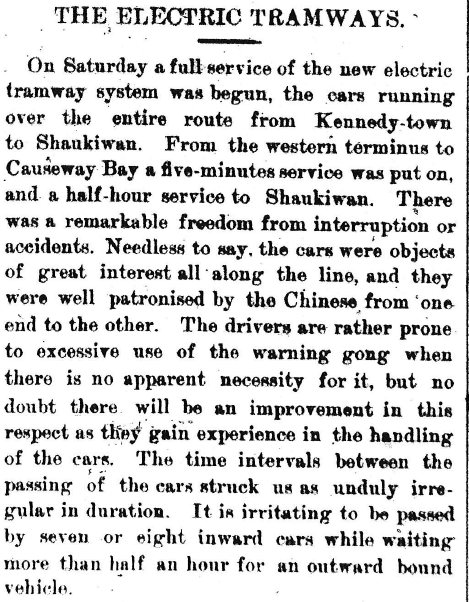 However, The Hong Kong Daily Press of Monday, 15th Aug 1904 states that the full service of the Electric Tramway had begun two days before on Saturday the 13th. 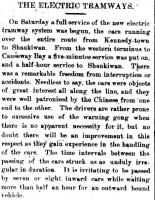 It mentions that the cars ran over the entire length of the route from Kennedy Town to Shaukiwan. From the western terminus a five minutes service was operated with a half-hour one to Shaukiwan. It is amusing to note that the writer spends half the of the article criticizing both the warning gong and the irregularity of the trams arrival. But gong not bell? When did the gong change to the beloved Ding Car? Details urgently needed. Hong Kong Central Library, Causeway Bay.